One year after I wrote the controversial, much reprinted column Achtung! Are We the New Nazis?, how much has changed? Have things gotten better or worse in Iraq for "liberating" US troops and the so-called liberated Iraqi people? Sadly, the much-ballyhooed liberation has become the brutal occupation we critics always predicted it would become. But warhawks have now gone from cheerleaders of war to apologists for war criminals, and proponents of the difficult but necessary surgery in Iraq, of indefinite subjugation. Ten days before the invasion, Bill O'Reilly penned The New Nazis, a concise Neocon memo for a preemptive strike against Iraq, concluding with an ironic twist: "Nobody can predict the outcome and aftermath of any war. But we can learn from history. Evil has a way of killing people"--affirmed the respected talk show host--"that's a fact." Doctor Joseph Goebbels--who predicted the power of radio for the spread of state propaganda--would have been proud of his rapt pupil. The sadly predictable, American self-denial--that our war crimes do not really represent our core values--smacks of the same self-denial many German citizens expressed when US general General George S. Patton, Jr. forced reluctant civilians to tour Buchenwald concentration camp in 1945. Before that time, the God-fearing Germans could almost convince themselves (as we've convinced ourselves), that their Christian ideals were intact--if only they could ignore the stench of death from the prison camp next door. 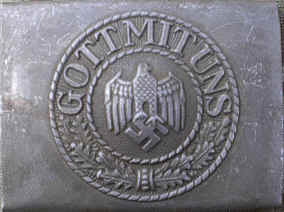 Perhaps those God-fearing Germans really believed the slogan imprinted on the belt buckles worn by their rosy-cheeked, well-fed soldiers--"Gott Mit Uns" (God With Us)--justified any atrocity in a patriotic struggle against the barbarian hordes from the east, as their state-supported media proclaimed. After all, if you really believe God is with you, any atrocity--even imprisonment, torture and death--is justifiable. American Special Forces veteran Stan Goff observed in an open letter to US troops in Iraq, "Abuses and violations of the Geneva Conventions and Laws of Warfare are already on record, such as: (1) Shooting people who are clearly not armed and who are engaged in no threatening behavior. (2) Shooting into ambulances. (3) Shooting wounded people who are not armed. (4) Shooting wounded people who are obviously no longer capable of fighting. (5) Shooting into crowds." One year ago I wrote: "Presently, American military veterans'rank and file former soldiers, mostly--are speaking out against American Imperialism, as well as ministers, artists, reporters, scientists and educators. But the powerful alliance of media monopolies and corporate-financed political leaders sway public opinion to war. In America, as was the case in Nazi Germany, the imperceptible slide to tyranny increases in direct proportion to the number of voices of conscience that are ignored." How many examples of cruel behavior do we need to read about in a year's time before we see the connection? Reporter Dahr Jamail interviewed many victims of systemic abuse, and the unmistakable signs of torture have a disturbing, Gestapo feel. What difference does it make if we call ourselves a Christian nation if we condone the jackboot smashing down of the doors of frightened citizens in the middle of the night, if we justify the beatings and intimidations, if we accept family members handcuffed, hooded and hurried away to a prison camp and held in conditions unfit for stray dogs? If we do not protest, we are accomplices. If those are not Gestapo tactics--and surely they are--perhaps they are closer to those methods used by the KGB, whose chilling motto--"WE never make mistakes"--were revealed in Aleksandr Solzhenitsyn's indictment of Soviet slave-labor camps. Besides the ten thousand Iraqi troops who were killed in the first weeks of the war, an unknown number of civilians died in the "liberation" that followed and the year since. This toll does not take into consideration the estimated 500,000 infants and children who died from disease--a slow, painful death for these toddlers--due to the ten years of economic sanctions installed to punish Saddam Hussein between the wars. Nor does it include those born into a living hell (click link below if you darel) the victims of our indiscriminate use of depleted uranium in the cradle of civilization but now mostly a poisoned mockery of Eden. Truly whether one is Pro-Life or Pro-Choice, evil is a child purposely defaced by poison. If for nothing else, this deliberate crime against humanity should send someone to the gallows. One year ago I wrote: "Are we the New Nazis? Could it happen here? Has it already begun? . . . . God is on our side, but which one? The vengeful God, the one guiding our radioactive armor-sheathed battle tanks as they slice through families of frightened civilians? Or the merciful one, providing protection to those same civilians? Is ours the God of the Gospels and Torah--or the horrible, hydra-like god of cluster bombs? Do our coins--comparable to the Nazi belt buckles-- really carry the motto, 'In God We Trust"? Columnist Maggie Gallagher wrote a column called The Banality of Evil some years before she justified her current support for the occupation of Iraq. "How did the Nazis do such unthinkably evil deeds?" she asks, "The same way a lot of us do lesser evils, apparently by pretending we're doing something else . . . . Monsters, we call these people, and feel better about ourselves. Whatever we've done wrong, it hasn't been so wrong as all that." Keep telling yourself that relative evil is acceptable, Maggie and Bill, uttering platitudes about American values. The true banality of evil is a quiet complicity rather than a loud and insistent outcry against cruelty and crime. The patriotic columnists of www.townhall.com are curiously quiet about the root causes of evil--the decades-long US support of dictators, tyranny and torture--but outspoken in the continuous application of American troops as a failed remedy. One year ago I wrote: "An instructive book, A Quick And Dirty Guide To War, gives an overview of the entanglement awaiting our armies of occupation. Although the authors fail to mention the term 'Islamic Jihad,' they clearly describe the Middle East morass and the fact that Afghanistan has NEVER been conquered by an outside foreign power. America, by the way, is superpower number four to try, and our influence extends only as far as the outskirts of Kabul." Since then we've discovered that many of the captured Afghan warriors who resisted our invasion and fought bravely for their country were forced into airless, metal transport containers. Before these remnants of the Taliban eventually ended up in Guantanamo prison, most of them died. Suffocated or shot, their bodies were dumped into mass graves. But no, we are not like the Gestapo, we insistently tell ourselves, and neither do we make mistakes. Certainly, If one can only repeat a lie long enough, does it not become the truth? But the faint sound of goose-steps echoes from the past. Sixty years ago, collective punishment was one of the many cruel methods the Nazis used to terrify and control an occupied population. When notorious Nazi Reinhard Heydrich was assassinated by terrorists--or freedom fighters, depending on your viewpoint--the reaction was swift and severe. "In retaliation for the assassination of Heydrich, Kurt Daluege ordered the destruction of the village of Lidice. The village was razed to the ground and its 173 male inhabitants were murdered. The 198 women were sent to a concentration camp in Ravensbueck. Another 256 Czechs were condemned to death for aiding the assassination plot. Thousands of Czech people were also deported to other concentration camps in Austria and Germany as a result of Heydrich's death." Does this sound like the recent reprisal against Fallujah for the murder of four American mercenaries? If the collective punishment against Fallujah--600 deaths and 1,500 wounded, for the torture and death of four contractors--was somehow justified and acceptable, then why weren't 150 Israelis brutally killed in reprisal for the intentional murder of Rachel Corrie? Ridiculous, inhuman and criminal, you rightly say, and I agree. But this is the distorted type of "justice" the rest of the world sees coming from America. Those foreigners who foolishly resist us--either passively or with arms--are "terminated with extreme prejudice." Civilians caught in the crossfire are simply "collateral damage." Children dismembered by bombs are simply the unfortunate consequences of a war of liberation. With such methods as these, does anyone truly wonder why "they hate us"? "We couldn't give her a proper burial," said one house owner in Fallujah, "because every time we would go outside, American snipers would shoot at us. They even shot at us when we retrieved her body from the car after the Americans bombed it." The head of the medical clinic says his clinic's ambulance was fired upon by U.S. Marine snipers twice during the siege. One of the clinic's volunteers was killed. "The Americans are dogs," he says. "They try to kill anybody who works in humanitarian aid. They attack any humanitarian aid worker, doctor, or ambulance to kill him." Many more bodies in Fallujah continue to rot under buildings that collapsed from U.S. bombing, he says. Water and power had been cut for weeks in this city surrounded and under siege. Nazi henchmen, Reinhard Heydrich and Kurt Daleuge--who ordered the destruction of Lidice mentioned above--would have certainly approved. Obviously, war is hell, and those who resist occupation have forfeited their rights. The imperial war eagle symbolized ancient Rome, Nazi Germany and now--conveniently--the US. One empire rose to power as a republic before slowly eroding into tyranny. The other empire--The Thousand Year Reich--began and ended as a tyranny. America might now be somewhere at the crucial divide, between right and might, between former greatness and outright fascism, where another few years reveals all. The Waffen SS may be closer to our future than we know. One year ago I wrote: "Will our soldiers soon be sporting 'God With Us' belt buckles over protective, Darth Vader body armor, wielding depleted uranium weapons in the Cradle of Civilization? How many My Lai-style atrocities'already occurring as I write this--or Beirut-type barracks bombings will we accept before we realize our occupation in Iraq is West Bank supersized? Before we commit too many more American troops to the Middle East--future victims of suicide shock and awe bombings or civilian slaughters like the one that happened in al-Fallujah--God-fearing American citizens should ask whether this Bush administration plans to continue expanding this empire at the point of a gun." One year later, the things I wrote have become etched in blood and sand, if not stone. "Thus far more than 10,000 American troops who fought in the first Gulf War (Desert Storm) have died from Gulf War Syndrome." One year later, the occupation of a "liberated" country continues, even as Iraqi opposition spreads. Iraq remains no more liberated than Hungary was in 1956. Nor does the future bode well, with increasing troop buildup. This week the Pentagon announced plans to shift another 47,000 troops into Iraq. Truly the winding road to tyranny is a slippery slope; we are upon it, and evidently, there's no turning back.